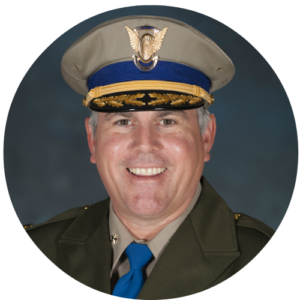 Mike Cardoza is an assistant chief with the California Highway Patrol (CHP), assigned to Central Division. Chief Cardoza started his career with the CHP in 1990, where he was assigned as an officer in the West Los Angeles Area. After spending five years in Southern California, he transferred to the Fresno Area where he patrolled the Area by motorcycle. His love for motorcycles led him to Sacramento in 2000, where he served as an instructor at the CHP Academy’s esteemed Motorcycle Training Unit. He was then promoted to sergeant where he served in two different assignments, as a field sergeant in the Santa Rosa Area and as an investigations sergeant in the Office of Internal Affairs. He was then promoted to lieutenant where he served in the San Francisco Area, the Office of the Commissioner, the CHP Academy, and the Auburn Area. He then was promoted to Captain and selected to command the Bakersfield Area and the North Sacramento Area. Currently, Chief Cardoza oversees the Fresno Area, Central Division Special Services Programs and the Special Operations Unit. These units are comprised of the Commercial Enforcement and Education Unit, Safety In Farm Labor Education Unit, Recruitment and Backgrounds Unit, Multi-Disciplinary Accident Investigation Unit, the Air Operations Unit, Gang Task Force, and Auto Theft Units. Chief Cardoza is a graduate of the 248th session from the FBI National Academy, and a graduate from Washburn University where he was awarded his Bachelor of Business Administration degree in Marketing Management in 1989. Throughout his 26-year career with the CHP, Chief Cardoza has completed numerous training courses and attained several certifications. The most notable courses are; Advanced Management, Command Management, Insurance Fraud, Criminal Investigations and Homicide, and received management certification from FEMA in Field Force Command, Planning and Operations. Chief Cardoza has been recognized by many organizations throughout his career and was recently awarded a California Senate Resolution, authored by Dr. Richard Pan 6th Senatorial District, Mother-Baby Friendly Workplace Award, and an award recipient from the United States Achievement Academy in the Study of Marketing and Management during his studies at Washburn University. When Chief Cardoza is not working, he spends time with his daughter Jennifer and son Garrett, enjoys riding his personal motorcycle and participates in several outdoor activities. Chief Cardoza was born and raised is San Diego, California and currently resides in Clovis.